Every backtest in MT4 even 99.9% is like fugazi...You must test an EA in MT5 with real tick to know if it really works. UseTimeOut: close all the trades after MaxTradeOpenHours (I prefer to use UseTimeOut - I mean: EA will close all the trades after MaxTradeOpenHours = 5 hours). Max Trade open Hours and others. Rule: Use Pair With Minimal spreads, one I use EUR / USD With Time Frame 1 Minute. I traded it on demo today for EURUSD M1 timeframe and USDCHF M1 timeframe. I used LotExponent = 1.4; UseEquityStop = true; UseTimeOut = true with MaxTradeOpenHours = 3 (other settings are by default). The statement is attached in zip file. Do not use this EA during (and immediate before - immediate after) medium/high impacted news events! The setting (set files) for this EA are proposed on this discussion page. This EA was improved here (free to download) and this version does not use martingale feature (and some rules for buy/sell was changed too). 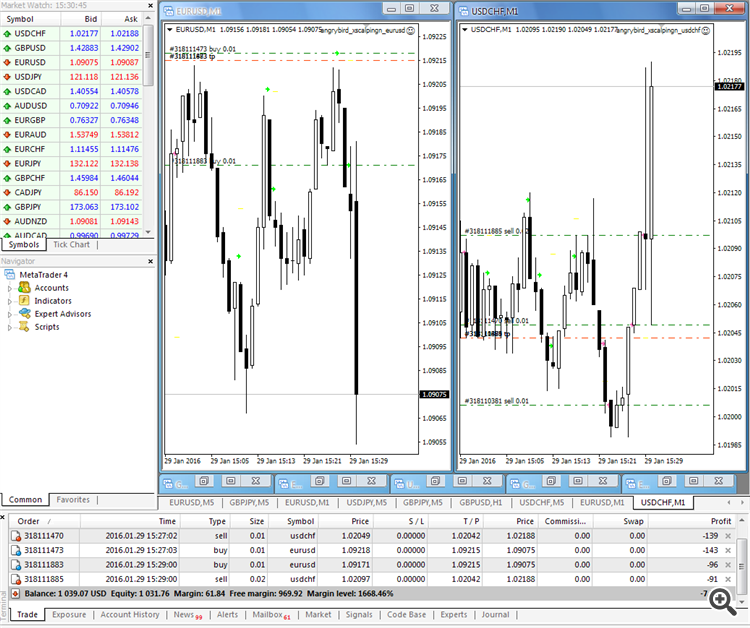 for EURUSD M1 - download set file from this post. for USDCAD M1 - download from this post. for EURUSD M5 - this post. Some people (incl brokers) understand that the scalping = trading with less than 10 pips in profit/loss (4 digiit pips). Yes, it is martingale scalping (most popular but most dangerous one). This didn't work in my back testing, couldn't find the right settings. If anyone has some settings that are successful please share. I've cleaned up the code a little bit so that it compiles better. who said to you mt5 have real tick data in back test? Testing trading strategies on real ticks and the explanation is on this post.